Get great tips for how to store your belongings at home and in self storage units. Things to remember when using storage to ensure that what you put into storage and how to ensure that it comes out in the same condition as they went in. We cover all the options for storage in your home and how you can make the storage solution. We work through the various pros and cons for storage in the various options you might have. We have a few practical tips at the end of this project which will help you with packing up your belonging to put in storage. These will ensure that they will come out in the same condition that they went in, and that you can get to them easily if you need to. For more information about great ways to de-clutter and other storage solutions you can look at our storage and shelving section. 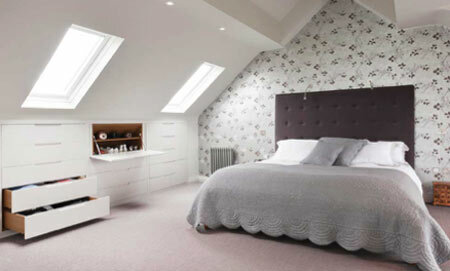 The loft is a fantastic storage space if you can get access to it. Typically there are two major problems nowadays; access to the loft can be poor so that you are limited to what you can physically get up there. Secondly, with the new recommendations for loft insulation encourage 270mm of insulation which it higher than the rafters. Putting boards or objects on top of this will squash it and stop it being effective. Before you can even consider this as a storage option, you will need to confirm that you loft is strong enough to support the extra weight. A loft will typically be designed to support 25 Kg per square metre, whereas a loft conversion needs to carry 150 Kg per square metre to support people safely. Of course you’re not planning to turn it into a living space, but you need to ensure that the roof construction is strong enough. You might need to strengthen the rafters and joists to ensure that the loft floor can support the weight that you intend to put there. We cover how to strengthen a load bearing floor and the relevant joist thickness and the spans that they can support in this project about load bearing walls. This is a serious business so if you’re unsure it is worth speaking to a professional loft boarding company or a builder to get professional advice – find a builder or loft boarder here. If you access to the loft is constricted, you will need to enlarge the hatch and probably then fit a new loft ladder. We cover this is detail in our project about enlarging a loft hatch here. 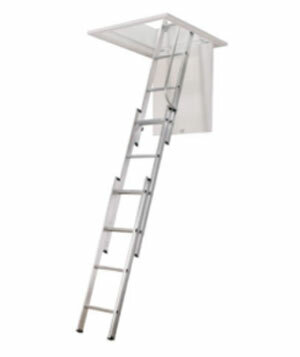 Modern loft ladders often come with the hatch and they are designed to connect directly to the hatch with makes them much easier to fit and use. We would recommend paying a little extra to get one of these as it’ll save time and stress. You can enlarge your loft and fit a new loft hatch yourself, but it is really a two man job so it’s worth getting some help for the day. 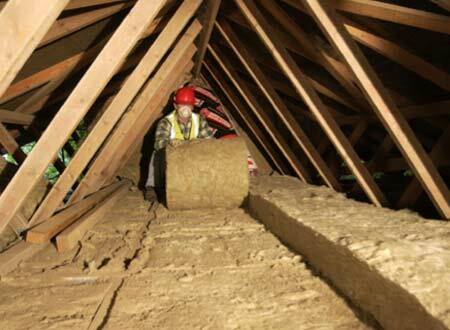 It is recommended that you use 270mm or just over 10 inches of insulation in your loft. 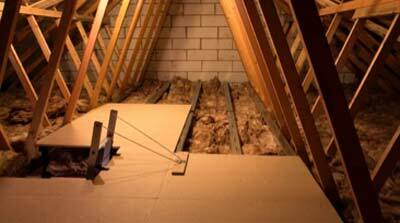 The problem with this is that this amount of insulation cannot fit below loft boards fixed to the joists or rafters. If you squash the insulation it loses all the air in it making in ineffective, so you might as well not have it there is the first place. There is a solution. You can build a raised deck above the insulation so that the weight is transferred directly to the rafters without squashing the insulation. You could probably build this deck yourself, however we would advise buying a purpose built kit. These are typically made of lightweight materials such as plastic and aluminium, so that they are strong to hold the extra weight of your storage, while being as light as they can be so that they don’t not add unnecessary extra weight. Creating a storage deck above your insulation is a great DIY job, and you can find out how to do it with the market leading solution, StoreFloor from Loftzone. If you prefer to get someone in to do this for you there are plenty of suitable loft boarding companies who can help – find one here. This is typically a much bigger proposition that boarding out the loft, particularly if you don’t already have a cellar space. You would not do this normally unless you are in a really prime location and the expense is worthwhile. You can find our more in our project that explains digging a basement. However if you already have a basement or coal scuttle under your home this might be a very useful piece of storage for you if you can get it into a usable state. This will generally involve some form of tanking to stop the moisture getting in and causing problems. 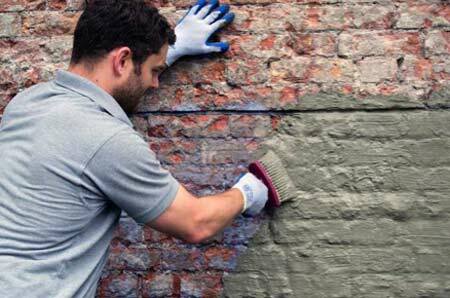 The difference between the two is that a tanking slurry is used to apply a waterproof coating to the wall and stops all water getting into the basement. The cavity membrane is a way to manage the water that gets in and ensure that it doesn’t get into the living space. Both these solutions are explained in more detail in our underground water proofing project. If you are simply converting an existing cellar to storage space – rather than living space – you would opt for the cheapest option that will achieve a dry space. Often people consider putting some of their white goods in their cellars alongside the storage. If this is the case you need to consider how you are going to get the waste water out of the basement. You will need to get a pump fitted as the washing machine is unlikely to be able to pump it without help. There is no shortage of innovative built-in storage solutions that you can add to your home, however there are two places where there is often underutilised space; under the stairs and under the eaves. While both these spaces can be awkward, there is generally a lot of space available to use and it is relatively easy to make use of it. 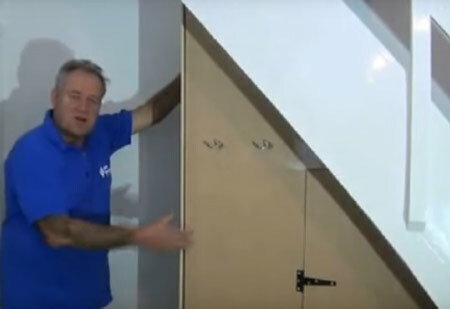 Have a look at our project to make a half width under stair cupboard from scratch here. This is a great DIY project, and we have included a set of plans that you can down load at the end of the project. Making use of the space under the eaves is a very useful way to get rid of the clutter. You can simple add an access door so you can store things there or you can go to town and get bespoke fitted furniture made up. If there is really no space in your home, or you want to get the clutter a little further away, then you might consider storage in your garage or shed. Obviously you need to have one or the space to build one. 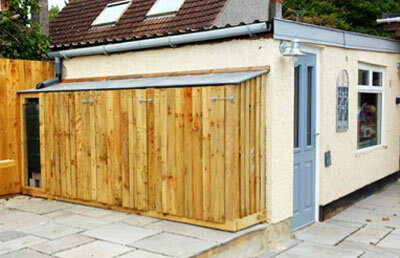 Here are a range of projects which will explain how you can build and ensure your outbuildings are suitable for storage. The most important thing to remember is that as your belongings are not in the house they are more likely to become damp or be attacked by pests, so you should check them regularly to prevent excessive damage. If your garage is so full you can’t even get a bike in, or your office paperwork from 1995 is piled in heaps on bending shelves, it might be time to think about renting a storage unit. They are great if you are having an extension built or decorating some rooms, so need to get some furniture out of the house for a while. Storage units can be rented by the month to keep everything safe and clean while the work goes on. 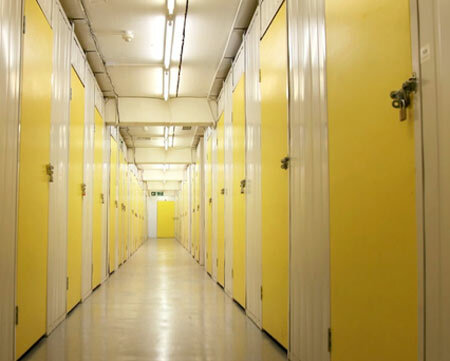 Storage units come in all shapes and sizes, and the buildings have strictly controlled temperature and moistures levels to ensure that your property is not damaged. As a halfway measure you can even have a storage unit delivered to your home. A unit, usually in the form of an 8 x 10 foot container, can be delivered to your drive. You can store your furniture in it while the work takes place and its picked up for you when everything is back indoors. The downside of this approach is that it is an extra cost, but if you have no suitable alternative it is well worth it. It is terrible the amount of damage that pests or damp can do to your precious belongings even in amount of time. Always label every box, it will save you hours when you need to unpack. Make sure you can see the labels!